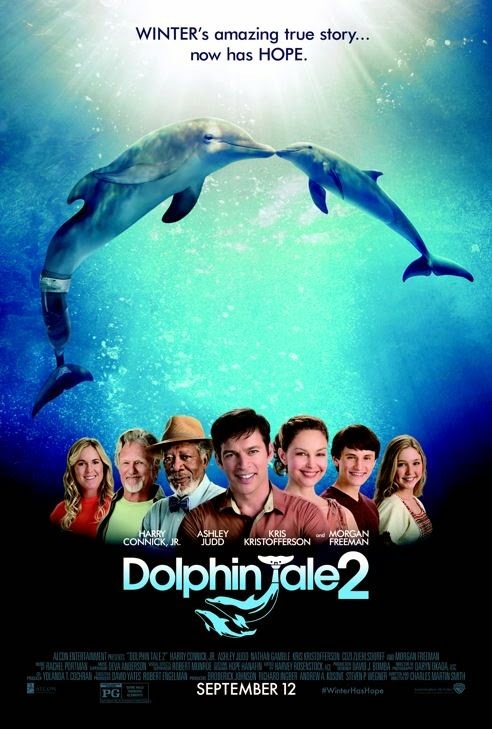 Today is a big movie day, as Dolphin Tale 2 is released. I don't know about your family, but all of my kids, at least when they were young, were totally fascinated by Dolphins. We read some amazing books through the years, and those are such cool creatures. I was intrigued by the opportunity to try out a homeschool curriculum that goes along with Dolphin Tale 2. Especially when I found out it was written by Sherri Seligson. Who is that, you might ask? She's the author of the high school level Apologia Exploring Creation with Marine Biology course. I had the chance to hear her speak once, online, and she clearly knows her stuff. This curriculum is designed for a wide range of ages, but I think it is strongest for the upper elementary range. It includes five lessons. Each lesson consists of a video segment, featuring David Yates of Clearwater Marine Aquarium (where the videos are filmed), and a pdf document that includes reading and activities. There is a total of about 15 minutes worth of video, and that is fascinating. David Yates presents information in a fairly straight-forward way, but it is interesting stuff, and with most segments only being a couple of minutes long -- and with plenty of footage of actual dolphins -- it is very likely to hold the attention of even the youngest viewers, without making the high schoolers roll their eyes. The pdf component is coded with little dolphin and sea turtle icons -- the dolphin means the activity is appropriate for elementary aged students, while the sea turtle indicates that it is good for middle and high school. Many activities have both icons, which is nice for a family like mine with a wide range of ages. I have to confess that the only reason my high schoolers gave this a chance was because of Sherri Seligson. Their initial response was a huge eye roll and a, "You are NOT serious!?" The material included is really good though. And it is fairly short. Short is a good thing. If my high schoolers were more interested, there would be plenty of meat to dive in further, but this way, they can work alongside the younger ones and move back to their regularly scheduled classwork. I have a giveaway today too -- a prize pack containing a fun t-shirt, and a pair of sunglasses, modeled above by Richard. My kids love them! My kids would definitively love to see Winter when we go to Florida. We love dolphins in this family. All my kids would use the curriculum as well! I had forgotten that I never did go and see the first Dolphin Tale. I'm so glad to hear movies that are worth watching are now having units built around them. I like dolphins I even watch the tv show Flipper! My girls love dolphins and would love using this curriculum! My kids all love Winter, we have actually met her and my son got to feed her. We are so excited about the 2nd movie..we can't wait to see it!